A Wrinkle in Time was only the beginning: rediscover an American classic with all seven of its sequels in this deluxe, two-volume collector’s edition boxed set. 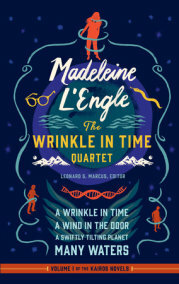 Here, for the first time, in a newly-prepared authoritative text, Madeleine L’Engle’s iconic classic A Wrinkle in Time, one of the most beloved and influential novels for young readers ever written, is presented with all seven of its sequels–what L’Engle called the Kairos (or “cosmic time”) novels–in a deluxe two-volume boxed set, complete with never-before-seen deleted passages from A Wrinkle in Time. L’Engle’s unforgettable heroine, Meg Murry, must confront her fears and self-doubt to rescue her scientist father, who has been experimenting with mysterious tesseracts capable of bending the very fabric of space and time. Helping her are her little brother Charles Wallace and her friend Calvin O’Keefe, and a trio of strange supernatural visitors called Mrs Whatsit, Mrs Who, and Mrs Which. But A Wrinkle in Time was only the beginning of the adventure. In A Wind in the Door, Meg and Calvin descend into the microverse to save Charles Wallace from beings called Echthroi, who are trying to erase existence. In A Swiftly Tilting Planet, when a madman threatens nuclear war, Charles Wallace must save the future by traveling into the past. And in Many Waters, Meg’s twin brothers are accidentally transported back to the time of Noah’s ark. The final four books center on Calvin and Meg’s daughter Polly. 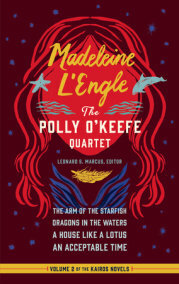 In The Arm of the Starfish, Polly disappears, and Calvin’s research assistant is implicated in her kidnapping. In Dragons in the Waters, Polly and her brother Charles are on a ship sailing to Venezuela when they help solve a murder connected to a stolen portrait of Simon Bolivar. Polly receives an education in different kinds of love in A House Like a Lotus. And in An Acceptable Time, Polly is lured through a tesseract by a friend who may be hoping to sacrifice Polly in order to save himself.